I had never used JustRite Stamps before. I love how interchangeable they are. I was thrilled, the Tag Making Kit came with the stamps and the Spellbinder tags!! 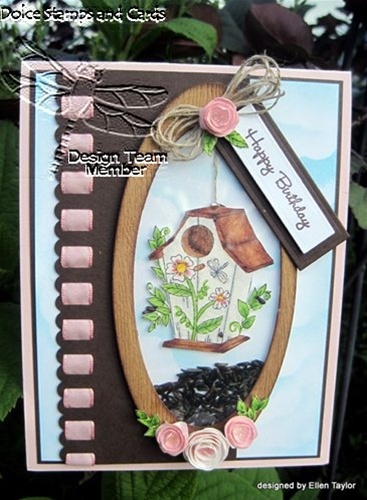 This Shaker Card was such fun to make! I used the smallest Large scallop Oval from Spellbinders as a cloud template and sponged the background with Tumbled Glass Ink. I made some hand rolled roses and sponged them with Spun Sugar ink. 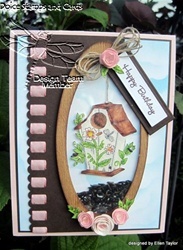 The Birdhouse is colored with copics and is popped up for added dimension. I stamped the image again and cut the leaves out for the roses. Since I store my stamps without their packaging, I used the plastic packaging to cut the window for the shaker card, using the Mega Ovals. For a little extra pizazz I added Stardust Stickles to the wings of the dragonfly and the centers of the roses. I quite enjoyed using these Justrite Stamps! !